The European Association for Psychotherapy Association Européenne de Psychothérapie Europäischer Verband für Psychotherapie Member of the World Council for Psychotherapy (WCP) NGO with consultative status to the Council of Europe. this organization is in line with EAIP criteria. As a visitor and evaluator I see Psychocorrection and Psychodiagnostic House Dendroni and The International Academy of integrative psychotherapy, which is a part of Dendroni as a very professional organization which provides training of integrative psychotherapy with high standards. Organizing the integrative psychotherapy in Georgia is a pioneering work which can be admired. The International Academy of Integrated Psychotherapy, based on Dendroni's base and it provides the establishment of appropriate psycho-therapy knowledge in the European standard in Georgia. For those interested in acquiring new knowledge, practical psychology and psycho-council, specialists employed in psychotherapy, providing short and long term professional training programs for all interested individuals at high academic level, in accordance with educational and professional ethics. In today's modern world, the role of psychology and psychotherapy was clearly demonstrated in practically all areas of human activity. For many reasons psychotherapy was crisis field in Georgia. It was neccesery to establishe effective organization, which set a goal to develop psychology and psychotherapy in this country. 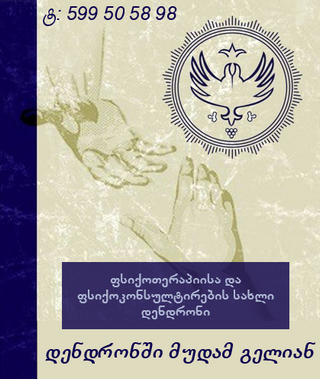 On September 27, 2011 was created Psychotherapy and Psychocounseling House Dendroni as an Non-Governmental organization.